Happy 238th Birthday to the United States Marine Corps !! And especially to those who lost their lives in the course of that service. The actual birthday is November 10th, and will be celebrated by Marines young and old wherever they happen to be stationed around the world. PLEASE FEEL FREE TO ADD ITEMS. The Marine Corps motto: Semper Fidelis. "Always faithful." December 1941. Shortly after Pearl Harbor, the American defenders at Wake, including elements of a Marine Defense Battalion and Marine aviation squadron, repelled the initial Japanese amphibious assault launched against them. Days later, the Japanese task force, reiforced by a carrier from the Pearl Harbor raid, would land again and overrun the defenses. The Marine coastal batteries are credited with sinking at least one Japanese destroyer, as I recall. Operations Watchtower, August 7, 1942. I consider it the Birth of the Modern Marine Corps, equipped and trained to conduct amphibious assaults against the enemy. Thanks largely to the vision and work of Marine legend Major "Pete" Ellis between the wars, the Corps had already been developing a modern amphibious doctrine long before Pearl Harbor. That doctrine played the vital role in America's island-hopping campaign across the Pacific. With lessons learned from each landing, the Marine Corps continued to fine tune its doctrine and tactics throughout the war in the Pacific. Operation Galvanic, 1943. It was to prove one of the bloodiest battles the Marines would fight in the Pacific War. The conquest of the Marianas, including the liberation of Guam, brought major Japanese cities within B-29 bomber range. 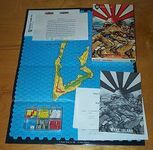 Saipan was the toughest battle in the Marianas. Arguably the most famous Marine battle, and known for often savage combat. The raising of the US flag on Mt. Suribachi remains one of the most iconic images in American history. The Chinese counterattack in late November 1950 against UN forces near the Korean-Chinese border forced the UN forces to retreat ultimately back to the 38th parallel. Marines surrounded at the Chosin Reservoir, supported by carrier-based close air support, fought their way out of the trap during deadly winter conditions. There were no probably more bitter Marine battles during the Vietnam War than the defense of Khe Sanh and the battle to retake Hue City. The Marine Corps has often fought alongside the US Army. It participated in the war with Mexico, including the storming of "the halls of Montezuma" in Mexico City, 1847. This is remembered in the Marine Hymn, their service song. Legend has it that the Marines earned the sobriquet "devil dogs" (teufel hunden) from the Germans they defeated at Belleau Wood in the First World War, though there is no German documentation to substantiate this. 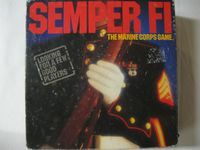 Nevertheless, the nickname stuck and has remained with the Corps. Its mascot is an English bulldog, always named 'Chesty' after legendary Marine hero Lt.Gen. Lewis "Chesty" Puller. The current Chesty is Corporal Chesty XIV, who recently relieved the retiring SGT Chesty XIII in a ceremony in Washington DC. Chesty's Marine duties include representing the Corps at public appearances and Marine ceremonies in and around the Nation's capital, and being kind to children who naturally can't resist giving him big hugs. Previous Chesties have been known to be reduced in rank for misbehavior such as peeing on the commanding officer's carpet, but they are always promoted for outstanding service and retire with the rank of sergeant. The Marine Corps has hundreds of tactical fixed wing and rotary wing aircraft. Whether flying from land bases or flight decks aboard Navy ships. its primary mission is to transport Marines to the fight and provide them with reliable close air support (CAS). Every Marine pilot and naval flight officer (NFO) must graduate from the Corps' Basic Infantry Officers Course at Quantico, Virginia before attending flight training and earning naval aviator gold wings. The result is an aviator who understands the fight from his brother 'mud Marine's' perspective, speaks his language, and is totally devoted to him and the success of his mission. About 10 years ago, when a Senate subcommittee asked the senior Marine Corps aviator, "General, how do you ensure that you get close air support when and where you need it?" the lieutenant general replied, "We paint MARINES on the side of the aircraft." "Legend has it that the United States Marine Corps was born on 10 November, 1775, at Tun Tavern, in Philidelphia, Pennsylvania. On that day, the Continental Congress passed a resolution authorizing two battalions of Continental Marines. The resolution was sponsored by John Adams. Since 1921, the Corps has celebrated its birthday as 10 November. Tun Tavern was a popular meeting place of 18th century Philadelphians. The tavern was frequented by sailors and other seafaring men, so it was a logical place to conduct the business of recruiting." When the Navy officers set up a table in the Tun Tavern and started interviewing prospects, they were a bit relieved to finally find a young man who fit their requirements. They had him sign the book, paid him his dollar, and bought a round of rum to toast the enlistment. They were so happy to finally get the whole process underway, they even had a second round. They then send him off to a table in the corner to wait. After a few more interviews, they found a second recruit, who soon joined the first. "This is great," the second recruit said. "They paid me right away, and even bought me a tot of rum!" "Hunh," sneered the first. "In the Old Corps they bought us two." 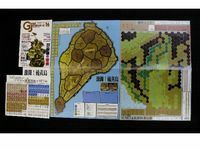 Tactical Combat Series game on the Battle of Edson's Ridge, Guadacanal. In Sept 1942 General Kawaguchi of the 35th Infantry Brigade attacked Lunga Ridge (called the 'centipede' by the Japanese for its distinctive appearance). The ridge was defended by 1st Raider Battalion and attached elements of 1st Marine Parachute Battalion, the entire force was commanded by LtC Merritt Edson. In a 2 day battle 800 Marines fought off 3,000 Japanese troops and prevented the capture of Henderson Field. After the battle, the ridge was called Edson's or Bloody Ridge by the Marines. Edson was awarded the Medal of Honor for his performance in this battle and retired as a Major General in 1947.